Christmas season is here and one Filipino Christmas pasttime that I remember from my childhood are the fairs, carnivals, and amusement parks. You’re definitely a Manilenyo child of the 80s if you remember Big Bang sa Alabang and Payanig sa Pasig. Big Bang sa Alabang used to be located where the Madrigal Business Park is now and its main attraction is the 4-storey Giant Slide. Payanig sa Pasig was located in what is now Metrowalk in Ortigas and it sported a medieval motif. Big Bang and Payanig’s contemporaries include the Boom na Boom Carnival at the PICC Complex and its neighbor Star City. Among these, only Star City remains in business to this day. The end of the Christmas carnival/fair era was marked by the rise of Enchanted Kingdom, which operates throughout the year. HI..SAYA NA MGA RIDES NYO,,MAY LALAKI KC AKONG NAKITA SA LOOB NA THEATER..MATANGKAD,MAPUTI,SINGKIT,SUPLADO,AT MAY NILALARO CXA NUN AT NAKAITIM..MAY TANONG SANA AKO KUNG BAKLA BA SYA????????? Star City is fun. I like to ride to the Merry go round, bump cars and catterpillar. in da catterpillar, you can vamit there. it is very fun. in the merry go round, i can see things around me. I did not went to the bumpcars bec. we don’t have time to make fun but i went to lion king, snow white, hercules, and little mermaid. I wish i could go to wild water. u can b wet there. u can’t change your t shirt.hahaha! so funny. 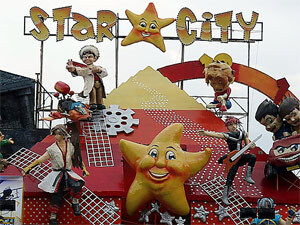 i luv to go there again.i like to invite everyone to go to starcity.bring your family and b happy. hmm cnu pwdeng mainterview sa starcity about sa mission,vission and history..